As I have mentioned, I have a lot of basil this year. My method for preserving it is simple: freeze it in ice cubes. The best thing about this method is that you can use the basil as needed. All I have to do it remove the ice cube from a bag, stick it in a strainer, and let it melt. The basil will be wet and soft and taste better than dried. It can be added to any dish that calls for basil. Cut the leaves off the basil plant. Discard the stem (they are great in vegetable broth). Cut the leaves into pieces and push down so they are packed into each indentation of the ice cube tray. Slowly fill the tray with water, then freeze until the ice is solid. 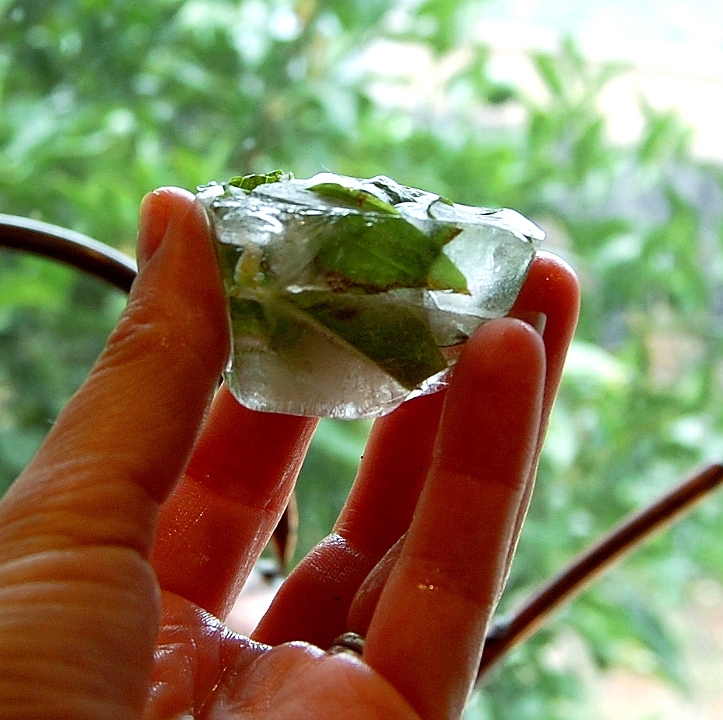 Remove the basil-ice from the tray and transfer in a plastic bag for storage. Use the basil as needed. genius! caprese salad’s whenever i want, life changing. thanks!